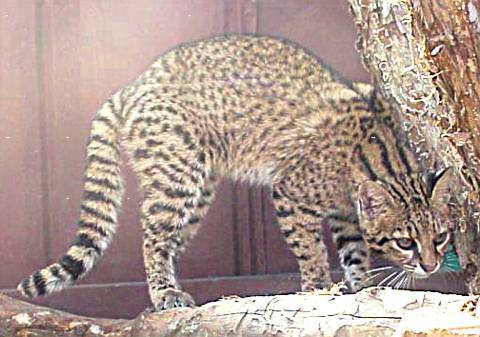 "The foundation cat of the Safari Cat breed"
Geoffrey of Bamboo Geoffrey is a Geoffroy Cat. He is about 10 pounds and an amazing cat with a very clear coat, and wonderful white belly. The Geoffroy Cat is native to South America and is being crossed on domestic cats to make a new breed called the Safari Cat. He is IPCBA registered. Geoffrey uses a litter box faithfully. Chili of Bamboo Chili is a Geoffroy Cat. He is about 9 pounds and an amazing cat with a very clear coat, and wonderful white belly. 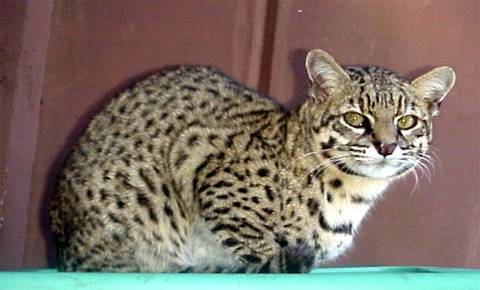 The Geoffroy Cat is from South America and Chili subspecies is located in Chili. Geoffroys are crossed on domestic cats to make a new breed called the Safari Cat. He is IPCBA registered. Chili uses a litter box faithfully.